Note: For instructions for installing AppDynamics v1.x, see (Deprecated) Installing and Configuring AppDynamics APM (1.x version). This topic describes how to install and configure AppDynamics APM for Pivotal Cloud Foundry (PCF). Note: Starting with v4.5.545, AppDynamics Analytics Support has been moved to a separate tile on Pivotal Network. If you want to use Transactional Analytics, install AppDynamics Analytics for PCF. Create a Pivotal Network account if you do not have one. If you are planning to use SSL, do the following based on the Controller type. AppDynamics SaaS controller use DigiCert Global Root CA. The tile automatically imports the DigiCert Global Root CA into the keystore used by AppDynamics Machine Agent and the dashboard app, if present. 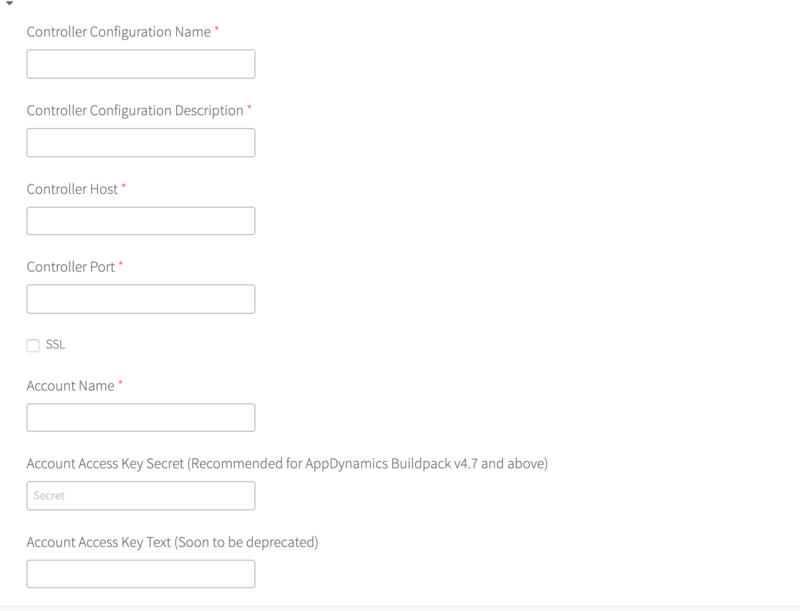 Enable the SSL checkbox in AppDynamics Machine Agent configuration. For OnPremise Controller deployments, upload the root certificate for the internal CA that signed the Controller certificate for your OnPremise Controller in the security configuration of the BOSH Director. For an example, see Security Page in the PCF documentation. Make sure to follow the exact format below while entering multiple certificates. If the AppDynamics Service Broker tile does not appear in the Installation Dashboard, click Import a Product in the left-side menu and import the AppDynamics tile. Double-click the AppDynamics tile in the Installation Dashboard. In the Settings tab, click AppDynamics Controller Configuration. Then click Add. Enter the following Service Plan options. All of these fields are required. Controller Configuration Name – A user-friendly name for this configuration profile. This name should include the Controller to which the Standalone Machine Agent reports. Controller Configuration Description – A more complete description of this configuration profile. In the Controller, click the gear icon (top right) and choose License > Account > License. In the Account Usage tab, under APM Usage, verify that the account has at least one available license unit for the type of application you are monitoring (Java, .NET, etc.). Account Access Key – The account access key used to authenticate with the Controller. In the Controller, click the gear icon (top right) and choose License > Account > Access Key. Controller Host – The host name or the IP address of the AppDynamics Controller. Example values are 192.168.1.22 or myhost or myhost.example.com. This is the same host that you use to access the AppDynamics browser-based user interface. For an on-premises Controller, use the value for Application Server Host Name that was configured when the Controller was installed. If you are using the AppDynamics SaaS Controller service, see the welcome email from AppDynamics. Controller Port – The HTTP (unencrypted) port used to access the AppDynamics Controller web interface. Defaults are 8090 (on-premise Controllers) and 80 (SaaS Controllers). SSL Port – The HTTPS (encrypted) port used to access the AppDynamics Controller web interface. Defaults are 8181 (on-premise Controllers) and 443 (SaaS Controllers). You can add multiple controller configurations by repeating steps 4 and 5. This will enable applications to bind to any of the entered configurations. Click Save to save the changes and return to the Installation Dashboard. In the Installation Dashboard, click Apply Changes and wait for all the changes to get applied.